Behold Atchafalaya Arcade. It’s an audio visual adventure that takes old technologies and scrambles them together in the present until something new and poetic arises out of the chaos. It’s the work of Tammy Duplantis who has been showing off the game at this weekend’s IndieCade Festival in LA. The game cartridge itself is the relatively straightforward part. Atchafalaya Arcade is being developed on a Game Boy cartridge and is loaded by docking it inside a Super Game Boy 2 cartridge inside of an SNES. From there, however, things get a little more complicated. The game has three different inputs which all feed into an audio mixer, all of which control different elements. The Game Boy for instance controls the rhythm, an SNES controller regulates the harmony, and the melody is governed by a Game Boy Advance. Pressing different buttons will lead to different pixelated patterns generating on screen as well as different music, with the entire setup doubling as both the game you play and the three-piece band you use to improvisationally create the game itself. And because the chip sets within each piece of old hardware differs, what the player outputs undergoes a second layer of manipulation with its own effect, like how the Super Game Boy runs slightly faster than the regular Game Boy making sounds which run from the latter through the former pitched up a quarter of a tone. 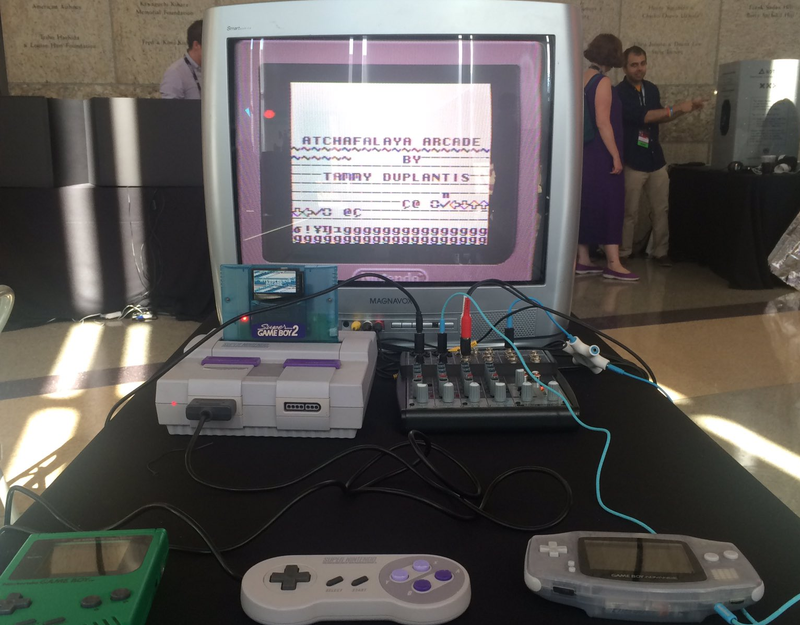 Speaking to VentureBeat, Duplantis said she began developing for the Game Boy because of the growing popularity of chiptune and using the device not just to play games but also to create music. One of her earlier games, Downstream, asks the player to navigate a sea of alpha-numeric symbols as they flood the display. You can try to slow down their flow or change direction with different actions generating different noise patterns. It’s simple in theory but the resulting playthrough, which doubles as a performance, can be harrowingly impressive. Atchafalaya Arcade is a more ambitious expansion on some of these ideas not least of all because of the disparate machines involved., Those colorful, intertwined pixel rivers probably don’t look half as good without a CRT TV. But it’s also a multiplayer game that lets you explore another person’s experience of Louisiana’s swamps through musical experimentation. It’s not unlike a dreamy, lo-fi combination of Rock Band and No Man’s Sky minus the resource collection mini-games and point systems.